American history captures the growth and development of a young nation, its culture, and its people. That story is often shared with Blackness at its fringes, though the Black experience is very much embedded in the fabric of American culture–from inception. Blackness is about a journey, the twists and turns, to belong. It is a warped, oblong existence that is constantly tested, stretched, reshaped, and stretched again, revealing a resilience, both nuanced and kindred with each generation. Blackness represents movement and evolution. The diaspora creates a space for Black expression in its many forms because no single experience is the same. Blackness is not a monolith. Family of origin, local culture, and education play tremendous roles in shaping the black experience for each individual person of color. The Red, White, Blue, and Black All Over juried show will add to the diaspora by opening a space for Black artists to visually express those experiences as the Americans they are. We hope to see a variety of personal stories filled with hope, joy, pain, and love. 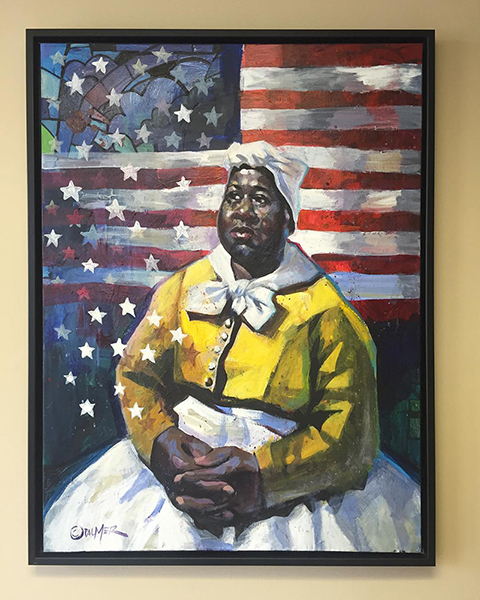 This exhibition has been made possible by The Daniel Foundation of Alabama and grants by the Alabama State Council on the Arts and the National Endowment for the Arts.